Despite its diminutive name, Les Alpilles, literally meaning the Little Alps is a rich and diverse area which makes it a popular tourist destination. During the summer, it may be one to avoid if traffic and crowds are not what you are after, but during the winter the area is calmer, and although some restaurants and shops are closed for the season, it is a small price to pay in order to enjoy the region in peace and calm. Wine writer and French resident Liz Gabay MW pays a visit and gives us this account. Les Alpilles are a range of jagged limestone hills, rising to 387m, which run west to east for around 25km, and 10km north to south. On the eastern side, the Durance River separates the region from the hills of the Luberon before flowing westwards, north of Les Alpilles. Between the river and the hills, lies a large fertile region, criss-crossed with streams and irrigation canals and filled with orchards and market gardens. North-west of Les Alpilles, the Durance joins the Rhône which then flows past the western edge of the hills. To the south the hills slope down to the now-drained marshes of Les Baux and the Rhône delta. The vineyards are located on the foothills of Les Alpilles, scattered between olive groves, Mediterranean scrub and forest. The vineyards of Les Alpilles are to be found in a circle surrounding the hills, and due to the very varied terroir (in all senses of the word – soils, aspect and micro-climate) the wines, labelled as AOC Les Baux-de-Provence or IGP Les Alpilles, have the potential to develop strong regional character within the appellations – I say potential, because outside of a serious blind tasting of all the wines, the subtleties of each region combined with winemaking variations, make it difficult to always spot these variations. The majority of the wines produced are red, made from varying percentages of Syrah, Mourvèdre, Cabernet Sauvignon, Grenache and an assortment of Provencal grapes. Most reds have a pronounced rich, concentrated black fruit and berry character with firm tannins. Rosé wines are often full-bodied, slightly darker in colour than many of their Provencal counterparts and more Rhône-style, as well as better suited to accompany a meal. White wines only received the Les Baux appellation in 2012, and many vineyards still offer IGP Les Alpilles wines from a range of grape varieties. Those with a higher percentage of Roussane tend to be more Rhône-like, those with more Rolle and Ugni Blanc closer to Provencal whites. The Les Baux AOC is also the very first appellation in France to stipulate that all wines must be organic. Water sources play an important part in the local agriculture. Derivations of the Gallo-roman word for water ’eig’ are found in the place names of Aix to the south-east, Eyguières, Eyragues and Eygalieres in the region of Les Baux, and Aigues-Mortes to the south-west. Fresh-water springs attracted the Celts, Ligurians, Greeks and Romans and the area is rich in archaeological remains. In the middle of Les Alpilles lies the archaeological site of Glanum, a Roman town including roads, houses, baths, temples and the foundations of a Fumarium or wine-smoking room. The site also boasts a small café where you can eat Roman style food. The wine estate Domaine Dalmeran lies on the original Roman via Domitia which linked Glanum to Beaucaire on its way to Spain; Roman wells and buildings can still be seen. To the south of Glanum lies the hilltop village and castle of Les Baux (‘baou’ in the Provencal language means cliff), whose history is the stuff of legends: Fearsome rulers who made their enemies walk through the window to their death on the plains below, troubadours, strategic marriages to many of Europe’s ruling houses, wealth, splendour and finally destruction. By the 18th century the castle and village were abandoned, but restoration began in the late-19th century, when artists and writers were attracted to the region by the climate, clear sunlight and the possibility to live cheaply. The first to come were Van Gogh (who painted the farm Mas de la Dame) and Daudet (who wrote ‘Letters from my Windmill’ in Fontvieille) in the 1880s; during the Second World War artistic refugees fled south from Paris and in the 1950s, René Dürrbach, painter, sculptor and friend to Picasso, moved to the region, buying Domaine de Trévallon in 1960. Visiting the vineyards is relatively easy, if you follow the road which encircles Les Alpilles. Starting in the north-west, between Orgon and Saint Rémy are Valdition, Romanin, Terres Blanches and Hauvette. West of Saint-Rémy-de-Provence, facing the Rhône valley, you will find Dalmeran and Trévallon and to the south, Estoublon (with château, restaurant and shop), Mas Sainte Berthe, Mas de la Dame, Gourgonnier, and Lauzières. 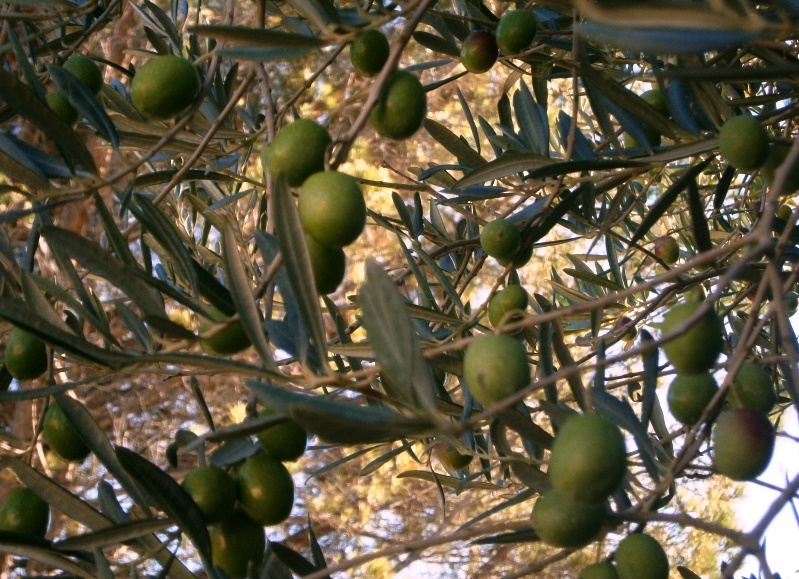 Many vineyards also make and sell their own olive oil, and it is also possible to visit olive oil producers. Moulin Castelas offers olive oil tastings with a range of oils from light fresh and fruity with hints of artichoke and pepper made from green olives, to dark rich and strongly flavoured oils made with black olives. 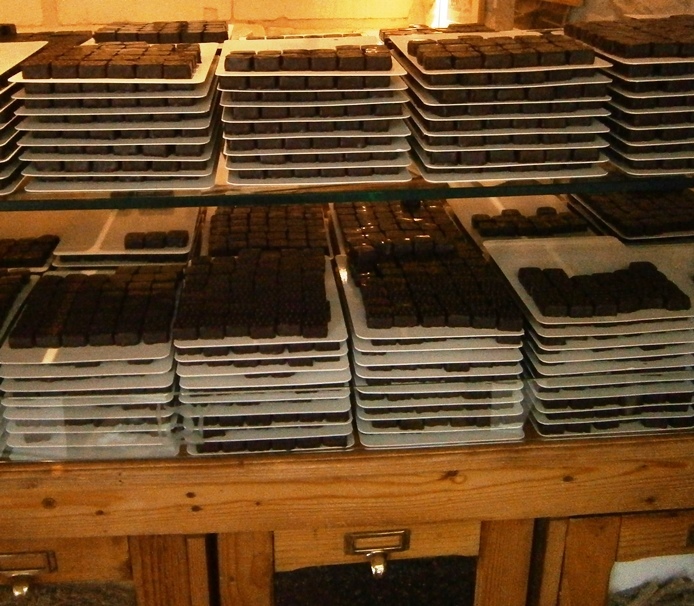 The harvest is early November with the new oil ready for sale by December. Saint Rémy-de-Provence is a great base from which to explore the region. A beautiful town in its own right, with abundant architectural evidence of its prosperous history, it is close enough to Avignon to be a commuter town, pretty enough to attract a large number of tourists and stylish enough to boast a number famous residents. The town is vibrant, if not cheap. Wednesday mornings see a magnificent market, which spreads throughout the town turning it into a vibrant, throbbing shopping centre. Indulge in cakes from the exquisite patisserie Marshal Mitchell, savour the perfectly aged cheeses in a tasting with Monique Mayer (both on Place Joseph Hilaire), or treat yourself to the amazing array of chocolates, including one flavoured with black olives, from Joël Durand (Boulevard Victor Hugo). Restaurants to suit all tastes and budgets can be found in and around Saint Rémy from Michelin starred (Baumanière, Ma Maison…) to pizza places. Do look out for local specialities from the Camargue – wild rice and gamey beef in particular. 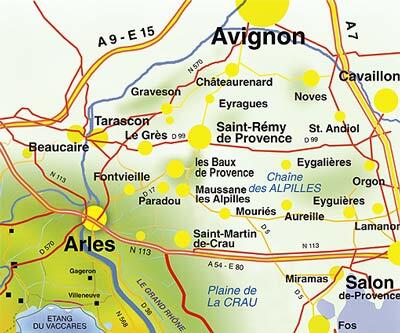 Contact details for all the wineries can be found on Les Baux’ appellation website that is in French, and for more details along with some extra information on the surrounding region, take a look at the Wine Travel Guide to Aix-en-Provence and Les Baux. Look out for Liz Gabay’s new blog, about to go live. All text and images are ©WineTravelGuides unless otherwise stated. You are, of course, free to link to any information on this site, but no posts, images or pages may be used in full without permission. See About our Blog for contact information.